Being an effective networker requires a lot of practice. Although some people are naturally outgoing, which helps them be better at networking, nearly anyone can be an effective networker with the right tools and mindset. We asked 10 business professionals from a variety of industries and backgrounds for their best networking tips. Their answers show that pretty much anyone can be an expert at making valuable connections; it just requires a little preparation and knowledge of what works best. Cat Crawford, a creative content consultant at Cat Crawford Marketing believes social media has replaced business cards as the way for exchanging contacts. “In today’s digital world, I feel like business cards are extremely outdated, so having an active social presence is crucial. I get more work from these events through social media than I ever would handing out a business card,” noted Crawford. Brent Csutoras, CMO of PeakActivity says focusing on one meaningful connection is far more valuable than a lot of surface level conversations that lead nowhere. Amanda Moyer, director of account services at Market Mentors, LLC believes many people forget about the host of a networking event when choosing who to reach out to. The host is sometimes the most valuable connection you can make. “As director of account services for our marketing and advertising agency, I attend a lot of social, client and political events; all providing different opportunities for networking. Before an event, I make sure to have my ‘elevator speech’ ready to make introductions smoother. I also prepare by learning about the event—speakers, topic or focus—so I can carry on informed conversations with other attendees,” said Moyer. Why Would You Want to Meet You? For his networking tip, Jacob Dayan, CEO and co-founder at Community Tax, highlights the importance of providing value to the other professionals with which you are mingling. People are interested in what they can gain professionally from you, and by being a source of insight, this can help you make the connections that you are seeking. “Focus on what you can give instead of what you can get. A lot of people walk into a networking event with a specific goal in mind. Whether that’s finding new client prospects or making useful connections, it is important to really listen and engage with the people that you meet rather than spouting out a prepared pitch,” said Dayan. Greta Schulz, president at Schulz Business SELLutions advocates taking advantage of all of the local organizations that provide excellent networking opportunities. “A common comment I get when talking about networking is, ‘I go to everything, I network all of the time. Go to everything in town.’ Besides being exhausted and collecting more business cards then a bowl at a tradeshow, you aren’t really accomplishing much,” said Schulz. How Can I Solve Your Problem? Dayne Shuda, founder of Ghost Blog Writers has a unique approach to conversations at networking events. “My approach, and my tip, for any type of person is to ask them about their job and tasks. Then I like to ask if they’re struggling with anything or working on something at the moment. From there I just try to listen to give them someone to talk to about what they’re working on at that moment. I don’t try to offer advice or tips or anything like that. I like to ask more questions and sometimes, more often than not, me asking questions helps the person work out some kind of idea that can get them unstuck or more efficient with what they’re working on,” said Shuda. Lana Elie, CEO at Floom believes networking is particularly important to business owners of small and medium sized businesses, even those that are less than outgoing. “I’m a naturally confident person, so [networking] comes quite naturally to me—but that’s not to say that if you’re not [outgoing] that you can’t work at it, said Elie. Unlike some of the former networking tips, Lori Cheek, founder and CEO of Cheekd still finds value in the trusty business card when attending networking events. “Understand that everyone is there for a similar reason and for the most part want to make new connections, so don’t be shy; just walk up and introduce yourself—the only thing you have to lose is an opportunity. Making real life connections has been the most helpful tool in helping Cheekd grow. In the world of business and networking, I recommend that you never ever leave home without your most essential old school networking tool—your business or calling card. Even in the crux of the digital age, business cards are thriving for a reason—it’s still the single fastest way to share who you are, what you do and how how you can be contacted,” said Cheek. Kent Lewis, president and founder of Anvil likes to use all of his tools to engage his network. “Treat your network like a garden. It requires constant care in order to grow and harvest. Regularly reach out to your network with updates via phone, email, LinkedIn and social,” said Lewis. Elene Cafasso at Enerpace Executive Coaching thinks it is especially important to choose wisely which events you attend. 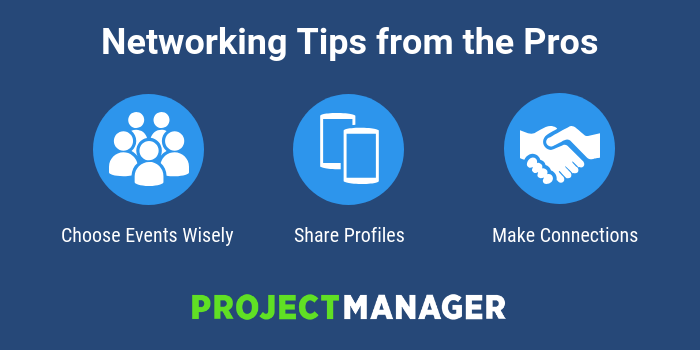 Now for our own networking tip: if you’re looking for a tool that can help you organize your various networking events, and organize your contacts as well as your projects with them, then ProjectManager.com is the perfect tool for you. Our cloud-based project management software has online data storage, task management tools and Gantt charts to organize all of your new projects. Try it out for yourself with this free 30-day trial.